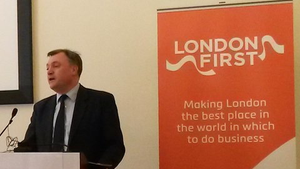 That is a picture of the shadow chancellor speaking at a business lunch today. But how did the copywriters at London First, or anyone else for that matter, fail to notice the ludicrous, pan-crashingly clumsy insertion of "in which" in their mission poster? I wince at this kind of thing in a child's homework, but on a professional piece of promotional copywriting I am literally* smashing my head on the table and questioning the purpose of everything. "And in this ever-changing world in which we live in…"
“And in this ever-changing world we live” (rhythm and metre aside of course). However, Paul McCartney is a songwriter not a copywriter. And the lyrics to Blackbird alone should exonerate him. The same cannot be said for the author of the London First poster who would be wise to remember that in copywriting, pithiness is everything. Slogans, straplines and mission statements should use as few words as possible. Unwelcome prepositions and relative pronouns should be ejected like violent drunks at a tea party. Making London the best place in the world to do business. *If you don’t believe me then I should remind you the definition of "literally" was extended to include its metaphorical opposite by the Oxford English Dictionary two years ago.